Window and door colors are relatively small details with a major visual impact in curb appeal. If you choose the wrong hues, it can be difficult and costly to correct your errors. If you’re timid about selecting your window and door exterior colors based on your gut feeling alone, it’s best to follow the norm. Most architectural styles, traditional and modern, have quintessential accent hues that highlight their character. Capes usually use forest green, while Georgian- and Federal-style units typically come in s andtone. Considering the factory-like design of Industrial Modern dwellings, their windows and patio doors are generally black on the outside. Tudor-style homes, on the other h and, are better off with red rock, cocoa bean, or dark bronze, reminiscent of wood elements. The usual purpose of window and trim colors is to connect every hue in the palette. They should complement the look of your roof, siding, and even hardscaping. Neutrals are your safest bet but don’t use shades of white or beige if they don’t make sense for your exterior design. A good rule of thumb is to pick the same color for your window frame and trim. A similar hue would avoid creating a jarring effect and make these architectural features more prominent from the street. In most cases, doors contrast with all other exterior hues. This is especially necessary when the body of your home is of a subtle neutral color. A striking color would set off your patio doors and help express your personality. 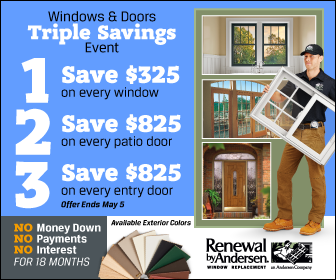 Let Renewal by Andersen of St. Louis help you tailor the design of your replacement windows and patio doors. We offer numerous customization options, giving you considerable latitude in putting the right elements together for impressive curb appeal. Call us today at (314) 332-2364 to schedule your FREE, in-home consultation in St. Louis, MO.